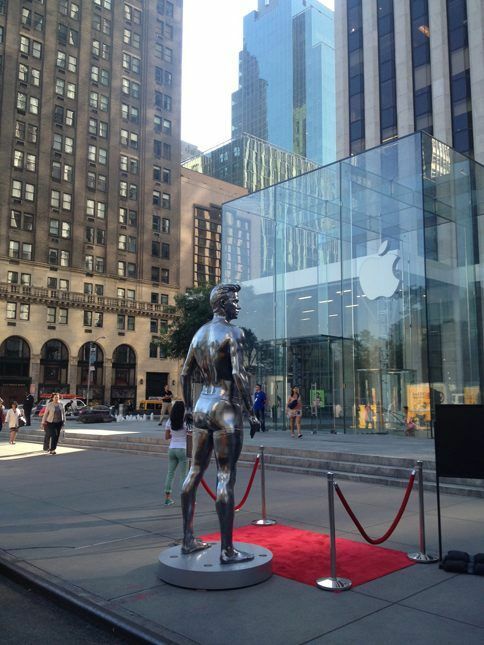 What’s This Half-Naked David Beckham Statue Doing Infront Of The 5th Ave Apple Store? David Beckham is one of the greatest soccer players of all-time. I think. To be honest I’m not really sure, because I’m American and we don’t really watch “futbol” all that often, but I hear he’s great and I know he’s famous, so he’s gotta be good, right? Not only is the dude super famous, he’s also super duper hot. Like, David Beckham is so stinking sexually attractive that silver statues of him in his glorious underwear are erected in his honor. And one just so happens to be outside the Apple Store on 5th Ave in NYC for some reason.